This past Black Friday, I was attuned to anything related to the shopping holiday because earlier that week there had been controversial urges from social media to spend #notonedime due to the Ferguson Decision. I was curious to see if anyone would keep their word. Would not logging unto shopping sites and barging through Best Buy at 6am really make a difference in demanding our judicial system to do better? Enthused may be an odd word to use, but as I watched Vine clips and Twitter updates of the protests held at St. Louis Galleria and West Country Center malls, I became so because people really doing it. They were protesting! For Mike Brown, for injustice. 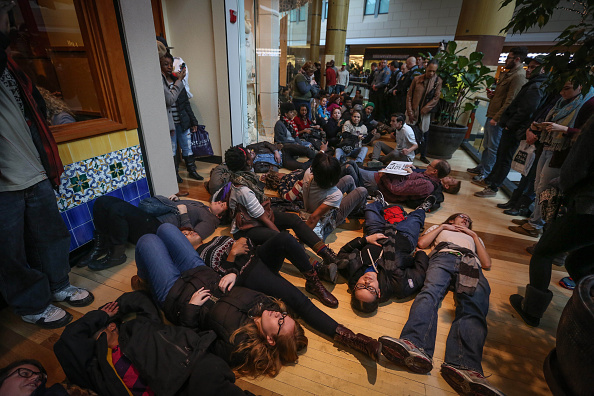 As protests tend to be loud in nature (the demonstrators chanted “hands up, don’t shoot” or “shut it down, don’t shoot”, some even threatened to start throwing chairs in the empty spaces of the food court), when hundreds chose to just lay on the ground (a “die-in/”sit-in”) and stay for some time, it was so cleverly understated, I wish St. Louis was only an hour away from where I was so I lay down in unity too. Seeing pictures of young, middle-aged, brown and Caucasian sprawled across cold floors of retail gluttony, in opposition of that image, my faith in the American people was restored. I say I was enthused, or excited even by the St. Louis mall protests because there was a layer of hope that more peaceful but powerful tactics were on the way. I also read that protests on Black Friday took place in New York, Seattle, and Oakland (albeit some turned ferocious). In America, we’ve had tragedies like Mike Brown in the last ten years occur before, but it seemed that whenever the suggestion of a revolution was on the rise , it always evolved to nothing more than a mirage.